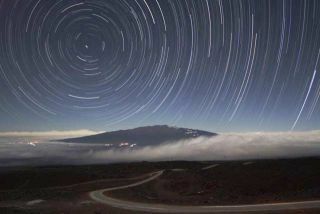 This classic star trail image shows how stars move in our sky as Earth rotates. More than 150 individual one-minute digital images were stacked in Photoshop. A first-quarter moon illuminated the surrounding landscape for the duration of the exposures. Astronomy is the oldest of the sciences, and quite possiblythe oldest use of astronomy is navigating by the stars. This craft dates fromprehistoric times among humans, and is even practiced by certain animals. For example, during the 1960s, a study undertaken by New York's Cornell Lab of Ornithology demonstratedthrough use of planetarium simulations that the indigo bunting, a brilliantly blue bird of old fields and roadsides, migratesat night using the stars for guidance. It learns its orientation tothe night sky from its experience as a young bird observing the stars. Some primitive tribesaccomplished amazing feats of pathfinding using only the sky as their guide.The Māori came to New Zealand from eastern Polynesia, probably in several waves between the years 1280 to 1300. With no instruments ortables to consult, they very carefully observed the night sky as well localweather patterns and ocean currents. In today's modern world, private andcommercial aircraft depend on a complex network of radio, satellite, inertialand other navigationsystems. But should any or all of these systems fail, the starry sky canserve as the last resort. The Nautical Almanac and Air Almanac arespecial annual publications printed both in the United States and the United Kingdom and describes the positions and movements of celestial bodies for thepurpose of enabling navigators to use celestial navigation to determine theposition of their ship or aircraft including the sun, moon and planets. In addition, there is a standard roster of 57stars used by aviators and navigators worldwide and chosen for their ease ofidentification and wide spacing. A navigator would try to measure the altitudeof one of these stars above the horizon during twilight, when both the star andhorizon are visible. This yields a "circle of position" on theEarth's globe; the observer must be somewhere on this circle to see the star ata certain altitude at a given time. Other stars yield other circles ofposition. The point where they all intersect is the observer's location. In order to be visible against atwilight sky, the majority of the 57 navigation stars are second magnitude orbrighter, although a few third magnitude stars were included on the list simplybecause they occupied regions where none brighter existed (the lower the figureof magnitude, the brighter the star). Also, it was agreed that allthese stars should have proper names. But some stars in the far-southern skylacked such monikers, so after World War II names such as Acrux, Gacrux andAtria appeared on navigators' charts ? contractions of the original Greek designationsfor these stars. Lastly (and not to sound likeMaxwell Smart): Would you believe this official list omits what many mightconsider to be the most important navigational star in the sky? Yes, it's noneother than Polaris,the North Star! Why? Merely because it liespractically on the celestial pole, so its altitude above the northern horizonalone pretty much indicates the observer's latitude, so there is no need toutilize it for the "circle of position" method described above.